Early on in Walden, Thoreau says, “It is true, I never assisted the sun materially in his rising, but, doubt not, it was of the last importance only to be present at it.” Presence at first light, ever elusive but somehow fundamental. The labors of many people require they rise before the sun, but being up early does not necessarily put one in the presence of the sunrise as an event, the first of the new day. Long-distance walkers are a privileged few as they, like Thoreau, are up and about, doing their daily labor before the sun, and most days find themselves lingering on some path watching the unfolding of yet another rosy-fingered dawn. In El Gamso on the Camino de Santiago, G–, my trekking partner suggested we get up early enough to see the sunrise from the peak at Cruz de Ferro. Walkers are game for most things, but this was a pre-dawn trek of 15 km including a long steep climb. At 4:00 am, we were up and in a few minutes hiking fast and hard down the path, headlamps dimly lighting the way. It was smooth but still there was the occasional stumble. An advantage of the early time was a sky awash with stars, the Milky Way streaming through the middle, punctuated by the occasional meteorite, but we had to ignore the sight most of the time, focusing instead on our feet. There was less than 3 hours time to cover the distance. Before long a crescent moon rose at our backs, partly showing the way. That time of morning brings new sensations. Birds often unheard call out. Different temperature gradients cross the skin. The earth and plants exhale unique odors. Setting a brisk pace, we made the the next town in good time but then had to climb a ridge in mud and flowing water, all as the horizon began to lighten ominously. Soon anticipation gave way to near despair. Pushing on through the just-waking village of Foncebadon, we crested the main ridge, still short of Cruz de Ferre but finding an ideal place to see the morning in. Sunrises happen every day but they are never the same. This day some low clouds ran interference as the orange intensified along the horizon, then a brilliant flash of yellow light turned our retinas purple. Soon the sun’s rays touched all around and, though we had not materially assisted in its rising, we had contributed our mite and received everything in return. It’s a strange feeling to have been up and toiling long and hard only to recognize that a new day has just commenced. We got up, stretched, and made our way to the Cruz de Ferre, an iron cross atop a tall wooden pole surrounded by a huge pile of rocks brought by peregrinos from all over the world. I found a rock by the path and pitched it over my head onto the pile, while G– retrieved the one she had carried from some far away place. Anticipation frames a moment, but the moment always exceeds it. Command, presence, inevitability, anticipation, anxiety. Sunrise is but one in 24 hours of moments, but it is a singularity, an edge, a precise point. It predates industrial time and is measured not in seconds or minutes but in duration–a taunt, stretched now that extends from the first bit of pure light to the emergence of the sun as full body. Heidegger, ever the interrogator, questions Hölderlin’s opening line: “Yet if “the fire” comes of its own accord, then why is it called? 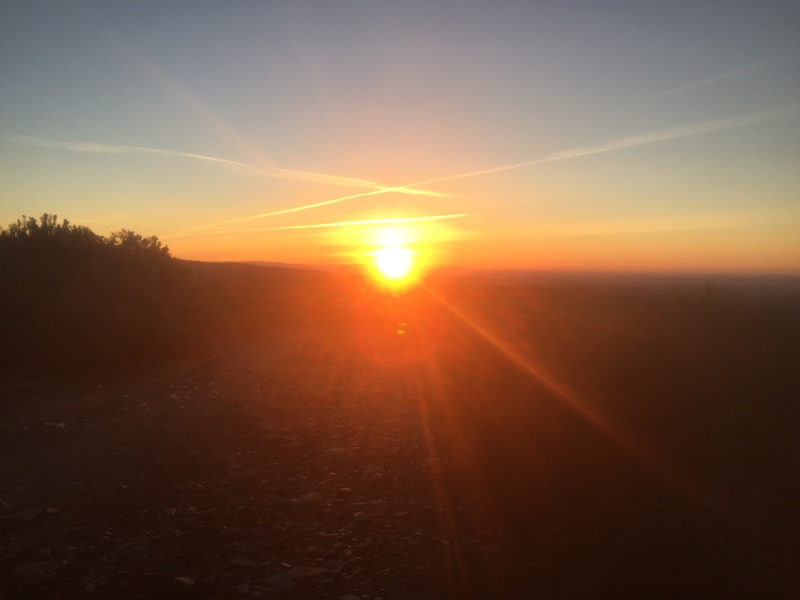 The call does not effect the coming.” He is pursuing a broader philosophical point, but his questioning uncovers the walker’s dilemma, one phrased by Thoreau differently but essentially asking the same thing: what calls for presence at a sunrise? Eager to see the day, we pause watching colors, the false dawn, then the moment of pure light. Our eagerness calls on the sun to come, but it was the sun all along that brought us to this ridge. Presence at sunrise questions Being in ways few other quotidian actions can. The most temporal of events calls the caller out of measured time into dureé. It is time as a thread stretched to absolute thinness. Clocks do not tick at sunrise; time expands, filling the horizon. But fire can bring destruction, and to think the now is to think its end. Not far from the Cruz de Ferro is the Galician Atlantic coast and Finisterre, the end of the earth in the Medieval world, the place where the sun goes to die. On the Costa de Morte there once was the altar of Ara Solis dedicated to that daily dying sun, something pilgrims witness with each sunset. Sunrise is both inevitable and not, prompting questions of the end rather than the beginning. Ben Schneider (of the band Lord Huron) asks, “what if the world dies with the sunrise?” Not an anxiety strongly felt by those called to witness the beginning of the day, but a thought that lurks in the background. To anticipate an event is to entertain the possibility of it not happening. Heidegger also calls the now the “time of poets.” The sun calls the poets to write. It calls walkers differently, not to give words but more fundamentally to mark the surface of the earth, to write paths with bootsoles. To be present at the sun’s rising, the way is trod, the ridge is climbed. To participate in the now of that moment is to be part of a longstanding community with feet maintaining the way and naming the history of the land’s dwellers, sometimes going back millennia. The pause on the ridge gives the sunrise a silent voice. An event made reverent by the act of stopping to pay attention, to attend. Deleuze asks of Leibniz and Whitehead “What is an Event?” He then produces a multiplicity of answers, or, to put it the same way, his answer is a multiplicity with some convergence. An event is a gathering to an intensity, a set of forces singled out and directing attention. It is, in Whitehead’s terms, a concresence of elements, the active creation of the new and, I would add, the now which is always novel. Sunrise calls out a particular now for our attention, showing by implication the production, the concresence, of all nows, however unremarkable others may be. Sitting there on that hill in that moment was an event. We did not materially assist the sun in its rising, did not wake the birds’ songs or paint the full palette of colors on the sky or cause the mist to rise from the plowed earth or bring both light and shadow to play across the land. But we were there attending and anticipating. Already wide-awake from a long, hard hike, we were there to begin the new day.